The core cast of the classic British sitcom Are You Being Served? 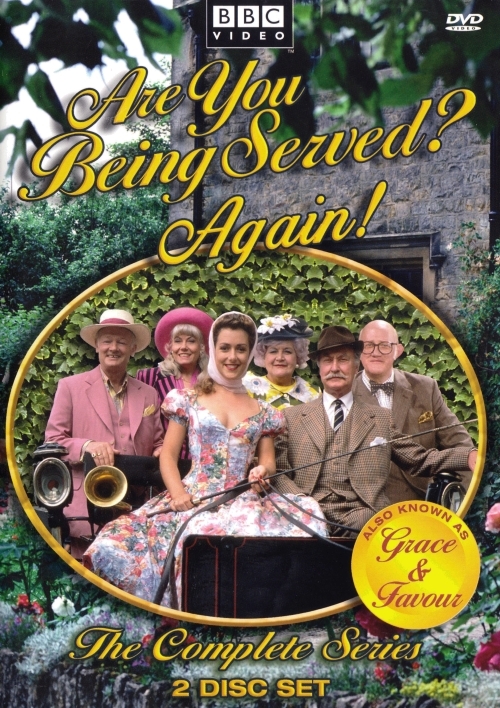 returns to run a country hotel in Grace & Favour (known in the U.S. as Are You Being Served? Again!). John Inman (as the deliciously fey Mr. Humphries), Mollie Sugden (imperious Mrs. Slocombe), Frank Thornton (snobbish Captain Peacock), Wendy Richard (cheerfully tart Miss Brahms), and Nicholas Smith (jug-eared Mr. Rumbold) transplant their Department-store banter to a small village manor house, where they grapple with such problems as a stolen gypsy cart, American tourists, a mummified cat, and the bubbly attentions of farmgirl Mavis (Fleur Bennett), who shares a warm bed with a dismayed Mr. Humphries. Some plot elements are labored (far, far too much is made of this bed-sharing) while others get tossed aside before they go anywhere (Mrs. Slocombe's husband, who left her 40 years before, appears for a single underdeveloped episode), and a few too many jokes are recycled from the previous series (including a lot of sexual double-entendres that don't quite fly when the cast is this long in the tooth). Nonetheless, the comic ensemble maintains their easy, enjoyable rapport, which is no small accomplishment.